Heinrich Himmler (* 07 October 1900 in Munich; † 23 May 1945 in Lüneburg) coming from a modest middle-class family, he was one of the highest Nazi dignitaries, responsible for the mass deportations of Polish citizens and genocide of European Jews, as well as many other war crimes. He was a farmer by education, and before he started his career in the Nazi party, he bred poultry. In January 1929 he became commanding officer of the SS (the paramilitary organisation of the NSDAP). Once the Nazis took power in 1933, Himmler succeeded, by participating in the bloody crackdown on the alleged “Roehm’s coup” to eliminate competition on the part of the SA, another Nazi paramilitary organisation. After 1936 he was the head of the German police, and after 1943, Minister of Internal Affairs. He continued running the entire apparatus for the violence and crimes of the Nazi state (all police troops, Gestapo, SD i.e. the internal security service). SS units ran special operations in occupied countries (e.g. Operation Tannenberg in Polish occupied land in 1939, which aimed at murdering the Polish leadership, especially in lands incorporated into the Reich). SS units also organised concentration camp teams who ran mass killings of Jews, Gypsies and representatives of other nations. In 1939, Himmler was appointed Reich Commissar for Reinforcement of the German Nation [Reichskommissar fuer die Festigung deutschen Volkstums], which meant that in practice that he was responsible for population policy in most occupied lands. In this role he also supervised deportations of Polish citizens (both Jewish and non-Jewish) from lands incorporated into the Reich. 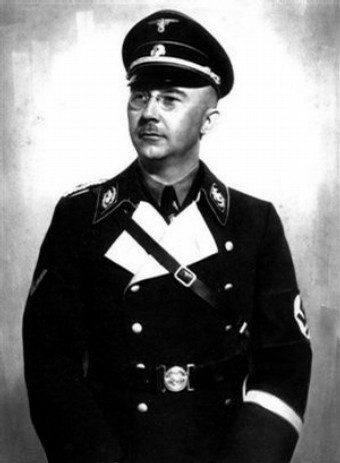 Himmler was co-responsible for all anti-Jewish operations, and killings in Nazi-controlled areas. His team drafted subsequent versions of the “solution to the Jewish issue”. The creation of a “reserve” for Jews in the General Government, or the deportation of the Jews outside Europe (Madagascar) were contemplated. After more and more areas fell under control of the Third Reich, the plans became more and more radical. Finally, once war with the Soviet Union broke out, Himmler initiated, controlled and gradually radicalised the policy of systematic exterminations of Jews in occupied areas of the Soviet Union. In the first months of the Soviet-German war (which started on 22 June, 1941) special SS commandos murdered a million (!) Jews in Eastern Poland and the Soviet Union. The killing of Jews spread over the whole of Europe quite rapidly. Six million Europeans of Jewish origin fell victim to the Nazi regime. During the last days of the war he attempted independent negotiations with the Allied Forces. For this reason, on 29 April, 1945, Hitler stripped him of all functions and expelled him from the NSDAP. On 23 May, 1945 he was taken captive by the Allies and committed suicide.